The goal of any add-on air emission control system is to minimize both capital and operating costs while meeting emission control requirements and maintaining consistent and reliable operation. | Nestec, Inc. The goal of any add-on air emission control system is to minimize both capital and operating costs while meeting emission control requirements and maintaining consistent and reliable operation. However, the highly variable nature of many industrial emission sources and the potential for process fluctuations can make it challenging to select the best and most economical solution. Equipment design experience combined with in-depth knowledge of all intrinsic detail features permits equipment that automatically adjusts to maintain maximum performance. Thermal or Catalytic oxidation is one of the most common methods to control the emission of Volatile Organic Compounds (VOC), Hazardous Air Pollutants (HAP), and hydrocarbons (HC) into the atmosphere. In the oxidation process, hydrocarbons are converted at an elevated temperature to carbon dioxide and water vapor. Several types of oxidation systems are widely used today, with Regenerative Thermal Oxidation (RTO) being the most common. Flameless Thermal Oxidizer is a direct recuperative or regenerative combustion system in which the burner(s) preheats the heat storage media prior to the introduction of VOCs or HCs and in which, subsequently; the destruction is carried out in interstices of the heat storage media in a flameless self-sustaining manner. NESTEC offers several Multi-Combustion Chamber (MCC) design features that can be added to existing RTO/RCO units. The design features are standard with NESTEC’s MCC RTO/RCO system offers. If you have a potential process change and/or new process exhaust that requires an RTO air emission control, contact NESTEC for a free process analysis. Uniform airflow distribution is a key design feature in all RTOs. It is crucial to achieving maximum Thermal Energy Recovery (TER) and Destruction Removal Efficiency (DRE), especially with larger heat recovery chamber units. Both mass flow and cycle time will also have a major effect on the RTO/RCO thermal efficiency and associated performance for both operating and destruction efficiency. Both are design features that NESTEC evaluates in all of their MCC RTO/RCO equipment offers to achieve the best and most economical solution for the application. 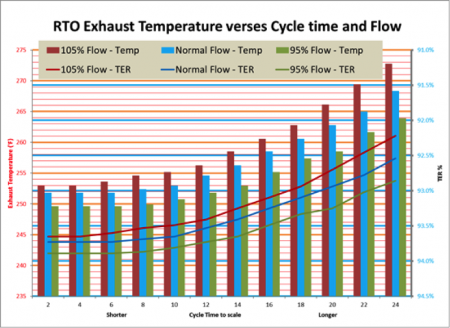 As shown in the following graphs, a 10% reduction in mass flow design will result in a nine (9°F) to four (4°F) reduction in exhaust temperature, depending on the cycle time. This can result in a $35,000 per year operating savings. In addition, NESTEC includes an Auto-Thermal Alignment feature with their MCC RTO/RCO units to maintain the mass balance in all heat recovery chambers. This feature helps maintain maximum thermal energy recovery, providing additional operating energy savings. 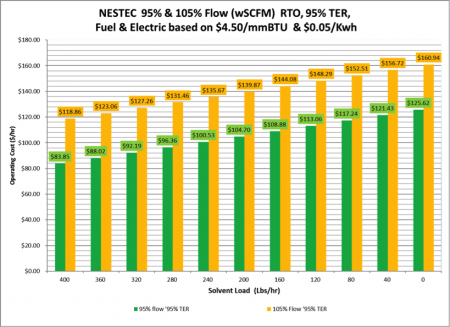 The typical savings is shown in the graph below which reflects actual data from a NESTEC MCC RTO/RCO operating unit, with and without Auto-Thermal Alignment. Several other features are also available with NESTEC designs, many of which can be applied to existing RTO systems.